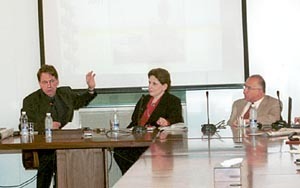 Dr. Steven Livingston, an expert from George Washington University, spoke to LAU students, faculty and Lebanese media professionals in a session organized by IPJ and the Public Affairs Section of the U.S. Embassy. Livingston is director of the Political Communication Program at GWU’s School of Media & Public Affairs. The speaker described how technology expedites journalists’ work by increasing their mobility and speeding communications — the most recent example being portable satellite phones. But he said these electronic marvels still don’t mean freedom from military and governmental restrictions in the coverage of war and terrorism. Today’s civilian system of systems — a term coined by U.S. Navy Adm. William Owens in relation to the use of information technology in warfare — frustrates cagey policymakers, who respond by aggressively restricting access to key areas, sometimes with fatal consequences for journalists, Livingston said. Livingston also fielded questions on the American media, government and public in relation to the current “war on terrorism” and Israeli-Palestinian conflict. Related clipping: Lecturer expounds on media, technology. The Daily Star, May 18, 2002.